Yes, it’s the Holiday Season and that means that schedules can be the tiniest bit frantic! After a day of holiday shopping (shop local, please) sometimes the temptation is to pick up fast food. But you can make a great delicious easy dinner with ingredients from your pantry – all in the time it takes to boil a pot of spaghetti. Here’s this year’s THE HOLIDAYS ARE DRIVING ME CRAZY quick dinner! Fill a saucepan with water and put in on the stove on medium heat. While the water is coming to a boil (about 3 minutes on my cooktop), dice the onion, sliver the garlic and zest the lemon. As soon as the water comes to a boil – add the pasta and cook according to package instructions (about 9 minutes). While the pasta is cooking, put a saute pan on the stove over medium-low heat. Add the olive oil and the onion. Cook six minutes – you want to sweat the onions, not brown them. Stir occasionally. When they have softened, add the slivered garlic and saute for 1 minute. Then add the wine, lemon juice, chicken broth, peas, tuna, salt and pepper and tarragon. Stir gently until the peas are heated through – about 2 minutes. While this is heating, the pasta should be finishing up. Drain it. Pull the pea mixture off the heat. Add the cooked pasta, the parmesan and the butter to the saute pan with the peas and stir until the peas, tuna et all and pasta are mixed together. If your saute pan isn’t big enough to hold the tuna/peas and the pasta – just dump everything into a big bowl and stir until mixed. Spoon onto plates and garnish with a bit more parmesan, a couple of grinds of fresh black pepper and the lemon zest. Nutritious. Delicious. Time elapsed – 12 minutes. Serve with Morovino Barbera or Dry Riesling! Just one of my many, many new obsessions. I love whole grain mustard, but it’s soooooooo expensive. Who’d have thought it was this easy to make. NOTE: for those of us who live on the Central Coast and really don’t have a good gourmet food store, you can get yellow mustard seeds at New Frontiers and brown and black mustard seeds at Amazon.com. Go for bulk sizes – those little tiny spice jars are waaaayyyyy too expensive. Sometimes garden stores will have mustard seeds as they are used for ground cover to keep land from eroding. Make sure the seeds haven’t been treated. 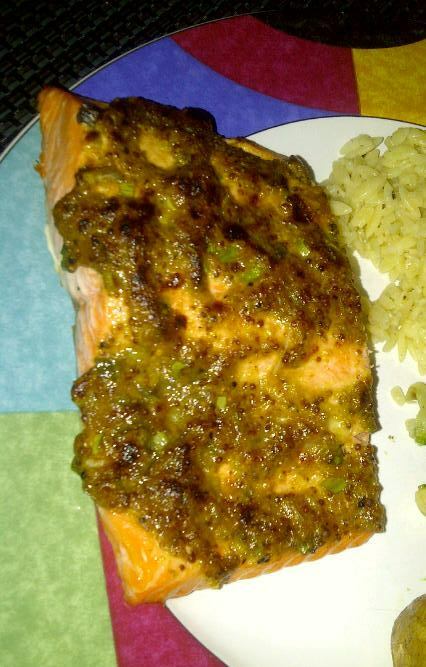 A recipe for easy, easy mustard crusted salmon follows, too. Put the mustard seeds in a pint mason jar or big coffee cup. Cover them with the 1/3 c. of vinegar – make sure that the seeds are completely covered- then cover with the cup with Saranwrap or put the lid on the jar. Let the seeds soak on your counter for up to 5 days. Top up the vinegar as needed. The mustard gets spicier the longer the seeds soak – I ‘m a 3-day girl–that’s about all the “spicy” I can handle. Pour off any remaining vinegar and reserve. Using your blender, immersion blender or mini chopper, grind the mustard seeds to your desired level of graininess. Traditionally this is done in a mortar and pestle. You can still do it that way if it floats your boat – but I love technology in the kitchen. Stir in ½ t salt and ½ t sugar. Use a little of the reserved vinegar to thin the mustard as desired. Refrigerate the finished mustard to stop it from getting stronger. The mustard is VERY sharp once you finish grinding it up. It needs to settle for a couple of days in the fridge before you use it. * The yellow seeds are tangy. The brown seeds are spicy. The black seeds are hot. My favorite blend is 2T yellow and 1 T each of brown and black. **You can use white wine, red wine or beer instead of vinegar. When you get to the blending stage, add vinegar to taste. ***You can use honey or any other sweetener instead of sugar. My last batch was Stout and Molasses which I was awesome on mustard glazed salmon (recipe follows). Set up your oven racks – one rack should be 2nd notch from the bottom and the other should be 2nd notch from the top. Preheat your oven to 400. Take out your rimmed baking sheet and line it with foil. Place the salmon filets on the foil, skin side down. Salt and pepper the fish. Stir the mustard, olive oil and green onion (OK, you could use chives, but I ALWAYS have green onion and I NEVER have chives) together in a little glass bowl. Place 1 big spoonful of mustard on top of each filet and spread it around. Put the baking sheet in the oven on the bottom rack and roast for 6-8 minutes, depending on how thick your filet is. After 6-8 minutes, switch your oven from bake to broil. Let the broiler heat, and move your baking sheet to the top rack until the mustard gets brown and crusty – about 3 more minutes. FLASH FROM MRS.VINO: Mix 1/4 c. Panko bread crumbs and 2T grated parmesan together, then sprinkle on top of the mustard crusted salmon just before your broil it – it makes an amazingly crunchy crust that really enhances this dish. Pull the baking sheet out of the oven. Using a spatula, remove the fish from the skin. Somehow, miraculously, the skin sticks to the foil and the fish comes right off – it’s kind of scary how easy it is. Serve with crusty bread or baby potatoes and your favorite veggie. Delicious and very easy. Pairs perfectly with Morovino Barbera (yes, I know that’s a red wine–rules are meant to be broken). For those of you who have visited the tasting room – this is the salad that Mr. Vino talks about that demonstrated the power of the perfect food and wine pairing! 1 lb. Of the largest shrimp you can find (is that an oxymoron??). Mrs. Vino uses at least 15/20 count—and buys them pre-cleaned and flash frozen. As we’ve said before, Mrs. Vino appreciates a good shortcut. If using frozen shrimp, please thaw first (I know you already knew that). Preheat your broiler on high. Quick trick to clean the Jalapenos: cut them in half lengthwise. Use a spoon to scrape out the seeds and the membranes. Do NOT scratch your nose or touch anything sensitive after handling Jalapenos—Learn from Mrs. Vino’s mistakes. Roughly chop the Jalapeno and put the Jalapeno, vinegar, soy sauce, cilantro, garlic, and sugar in a food processor—it actually fits in my mini-chopper, if you don’t want to get the big processor dirty. Process until finely chopped/smooth. Place shrimp on a broiler pan and mist with olive oil. Grill until they turn pink and are just cooked through—turning them once—this will take about 4-6 minutes. While shrimp are grilling, slice lettuce and cabbage and dice onion. In a medium bowl, combine veggies and toss with about ¾ of the salad dressing. In a small bowl, toss shrimp with the remaining dressing. Pile the salad on your plate, pile the shrimp atop the salad. Pile forkfulls of this into your mouth—Absolutely delicious and sooooooo good for you. Serve with a nice whole wheat roll. And, a nice glass of Morovino Barbera. Mrs. Vino’s loves unsual greens: mustard, chard, kale, etc. These have been incredibly fun to play with in the kitchen. They are so good for you, AND so delicious. Here is one of my favorite easy half-hour healthy recipes! Make and serve this with a light, dry red like Morovino Sangiovese or Barbera. In a small skillet, put the chicken broth, garlic, bay leaves, red wine and red pepper flake. Bring to a simmer over low/medium-low heat. Add the lentils, then the chicken thighs on top of them and cover tightly. Simmer the chicken thighs in the broth mixture for about 25 minutes. Remove the chicken thighs to a pyrex dish and put in a 250 degree oven to keep warm. Add the greens (if you haven’t tried mustard greens before, this is a GREAT recipe for them)to the braising liquid. Cover and simmer for 5-6 minutes or until tender (some greens will cook faster than others). When the greens are done, fish out the bay leaves and garlic, then add the Dijon mustard to the greens and braising liquid. Turn the heat up a bit and let the sauce reduce until it is slightly thickened. To serve, put a heaping helping of greens and lentils on the plate and top with 3 chicken thighs mmmmm.